Florence with kids can be overwhelming. I recommend a family specific walking tour to reduce the chaos and increase the appreciation of this splendid city. Context Travel offers interactive 2.5 hour “urban walking seminars” for families. We met our docent in the sun dappled Piazza della Signoria for a “Symbols and Legends” tour. Our guide Elizabeth wasted no time befriending my daughters. As they perused the Renaissance sculptures, she handed them a chisel and hunk of marble so they could experience the art form. Then we set off. Our tour was structured as a treasure hunt. 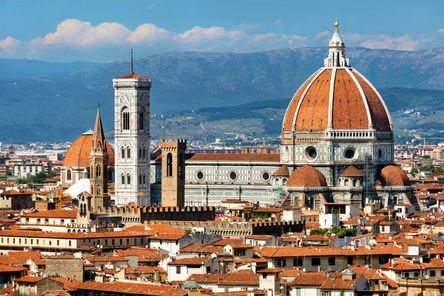 We walked the ancient streets pausing to uncover hard-to-spot carvings and mythological images that shed light on life in Renaissance Florence. All of the information was recorded in journals supplied by the docent. We ended up at the Duomo where the importance of the edifice and the Ghiberti doors were explained to the kids in a magical and engaging way. Another wonderful experience is the Secret Doors of Palazzo Vecchio, a behind-the-scenes tour of one of the Medici’s private residences. My kids loved scrambling up musty secret staircases , exploring hidden rooms and taking in the elaborate ducal apartments. Other kid specific guided tours are offered at The Palazzo Pitti, Galileo Museum, Uffizi and Leonardo da Vinci Museum.